It’s a beautiful spring day and you are walking through a lush, green boreal forest somewhere in northern Alberta. The sunlight streaming through the broad-leaved and coniferous trees reveal vibrant, rolling blankets of mosses covering the forest floor. 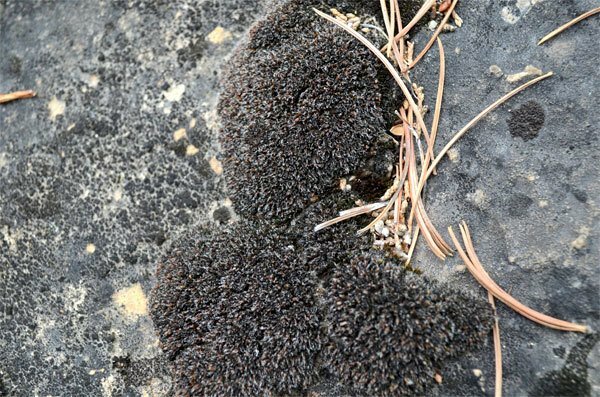 Scanning the scene you see that these tiny organisms seem to be everywhere–on stumps, decomposing logs, and at the bases of trees. You enjoy the view and start to walk on, but something compels you to stop. You crouch down and investigate further. Using a hand lens you realize that the miniscule plants display an astounding array of colours, branching patterns and detailed structures. Each blanket of mosses comprises dozens of different species, rich in variation; in fact, it resembles a miniature forest—a forest within a forest. 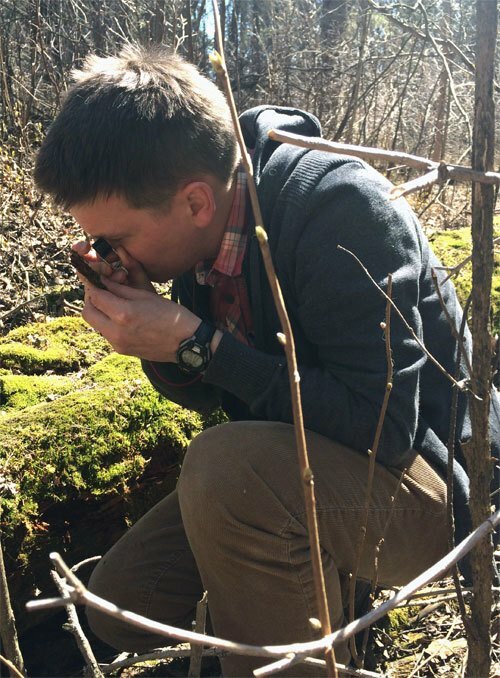 “It is not until you get up close that you start realizing just how intricate these small plants really are,” explains Richard Caners—an expert in the study of bryophytes, such as mosses—for the Alberta Biodiversity Monitoring Institute (ABMI) at the Royal Alberta Museum (RAM). “The closer you look, the more interesting and complex they appear.” Beyond their astounding beauty, these easily overlooked plants tell some compelling stories. They‘re the living embodiment of the early evolutionary history of plant life on this planet; they reflect the unique circumstances of their terrain and biological environment; and they can be early indicators of climate change and human disturbance in natural systems. As a result, bryophytes are one of the main species groups that the ABMI monitors across Alberta and experts like Caners are essential to the program. Bryologist Richard Caners looking at a bryophyte species on a decomposing log. 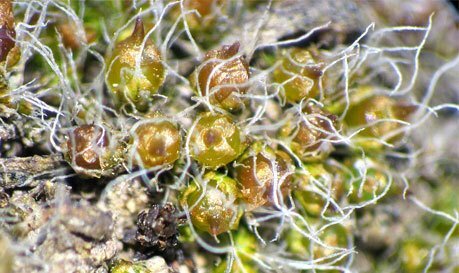 Bryophytes were the earliest group of land plants on the planet—scientists have been able to trace them back nearly 488 million years ago.1 This means that bryophytes are the evolutionary precursors of all vascular plants. Upon closer inspection (get on your hands and knees with a hand lens!) you can readily see that bryophytes differ from one another in size, growth form and colour. 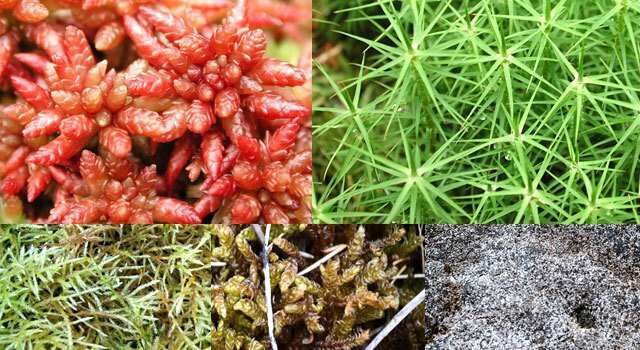 Mosses and other bryophytes come in an astounding span of colours—exhibiting shades of green, white, yellow, brown, orange, pink, red, and even purple. Their growth forms are so varied, they’ve inspired an associated vocabulary. Some species grow in highly branched layers called “wefts“, others grow in “mats”, in “turfs”, or “cushions”. In Alberta, there are also two species that have a “dendroid” growth form, where the mosses look like small trees, with an erect leafless stalk and branched apex (genera Climacium and Rhodobryum). There are also species of bryophytes that grow as “threads” and appear as the name suggests. The broad range of bryophyte shape and structure reflects the array of habitats where they grow. In the case of the “weft” mosses, such as the Stairstep Moss (Hylocomium splendens), Big Red Stem (Pleurozium schreberi) and Knight’s Plume (Ptilium crista-castrensis), they grow on the forest floor. These wefts grow in deep layers, thereby insulating the ground and preventing soil moisture loss through evaporation. Also, because they are loose and fluffy, with richly intertwined branches, wefts can act as barriers for germinating vascular plants, which prevent them overtaking the mosses. Species with the “cushion” growth form4 often grow in exposed, drier habitats such as sun-drenched rock faces. The dome-shaped colonies they produce are appropriate for sunny, dry conditions. The growth form helps to conserve water by providing a smooth surface that decreases air turbulence and evaporation and also reduces the surface area of exposed leaves and shoots. Other species that live in exposed locations exhibit adaptations, such as clear “awns” that project from the tips of leaves. These reflect sunlight to keep plant temperatures down, reduce UV damage to leaf cells, and create a layer of still air around the plant that helps reduce evaporation. Beyond the forest floor and sunny rock, bryophytes can make their homes in a myriad of places–on cliffs, decomposing logs, tree bark or animal dung, to name a few. Although bryophytes as a group can be found just about anywhere, many bryophyte species are dependent on specific habitats and growing conditions or “microhabitats”, which make them excellent indicators of changes in their environment. Microhabitats are defined by specific moisture, light and chemical conditions that must be met for the different species to grow and survive. 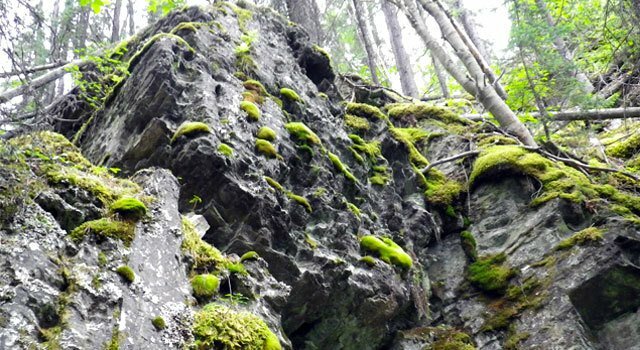 Although small in size, bryophytes are the dominant plants in many ecosystems throughout the province, including boreal forests and peatlands. Bryophytes have crucial roles in regulating water storage and flow; they also stabilize soil and prevent erosion in a lot of places. In some ecosystems such as ombrotrophic bogs5, bryophytes (in particular, Sphagnum mosses) have the ability to substantially modify or “engineer” the environment to create their own favourable conditions. Mosses are especially vital in peatlands, which cover about 16% of Alberta. These valuable ecosystems are incredibly important for carbon storage and regulation of atmospheric carbon. Peatlands contain deep deposits of partly decomposed organic matter or peat, which in many places may have resulted from more than 5,000 years of biomass accumulation. Since peatlands are particularly sensitive to changes in temperature and precipitation, monitoring the status of peatlands will provide insights about the effects of climate change. 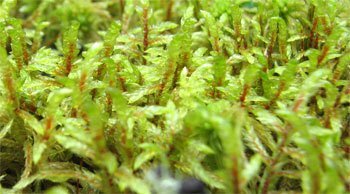 In addition to maintaining soil and playing a role in the water cycle, bryophytes are important habitats for invertebrates, which can grow in the axils of the leaves of mosses and liverworts. They are also an important food source: they produce spores that can be a nutrient-rich source of protein. Incredibly, in some boreal ecosystems, the net primary production in the bryophyte layer is higher than the tree layer or forest canopy. “It can be that significant,” says Caners. Furthermore, bryophytes contribute to nutrient cycles by sequestering nutrients in their tissues, which are released back into the ecosystem once the plants die and decompose. 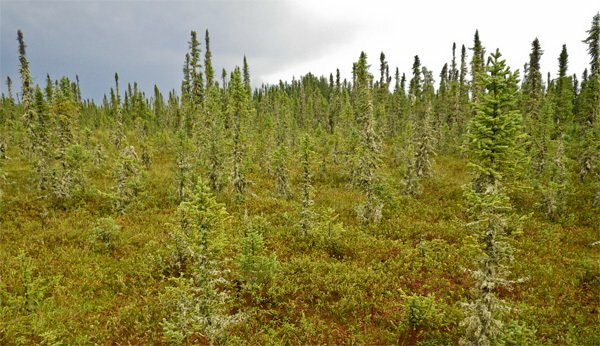 Despite being the first land plants, it was only recently discovered that some of the most common mosses in the boreal forests may actually help to replenish nitrogen, a vital and limiting nutrient in forest soils. It has been shown that several moss species, including the dominant Big Red Stem and Stairstep Moss, have symbiotic associations with nitrogen-fixing cyanobacteria that perform this service for forests. “This discovery has already contributed to a much greater awareness of bryophytes and the roles they play,” says Caners. There is much more to discover about bryophytes, including another unique adaptation that gives bryophytes a unique edge over vascular plants. Find out more in Part 2 of Alberta’s Wonderful World of Bryophytes, coming soon. 1. The Ordovician Period is a geologic period and system, the second of six of the Paleozoic Era, and covers the time between 485.4 ± 1.9 to 443.4 ± 1.5 million years ago (source: Wikipedia). 3. Bates, J.W. 1998. Is “life-form” a useful concept in bryophyte ecology? Oikos 82:223-237. 4. Many species that grow on rock have a cushion growth form. Examples include species in the genera Grimmia and Schistidium. 5. Ombrotrophic (“cloud-fed”) refers to soil or vegetation, which receive all of their water and nutrients from precipitation, rather than from streams or springs. Such environments are hydrologically isolated from the surrounding landscape, and since rain is acidic and very low in nutrients, they are home to organisms tolerant of acidic, low-nutrient environments. (source: Wikipedia).